Gut renovation of 1890's townhouse. New vertical circulation and dramatic rooftop skylight bring light deep in to the middle of the house. A new stair to roof and roof deck complete the light-filled vertical volume. Programmatically, the house was flipped: private spaces and bedrooms are on lower floors, and the open plan Living Room, Dining Room, and Kitchen is located on the 3rd floor to take advantage of the high ceiling and beautiful views. A new oversized front window on 3rd floor provides stunning views across New York Harbor to Lower Manhattan. The front yard was excavated down to provide ease of access to garden level floor, all new windows, new front steps, and new black bricks on the front facade complete the makeover. 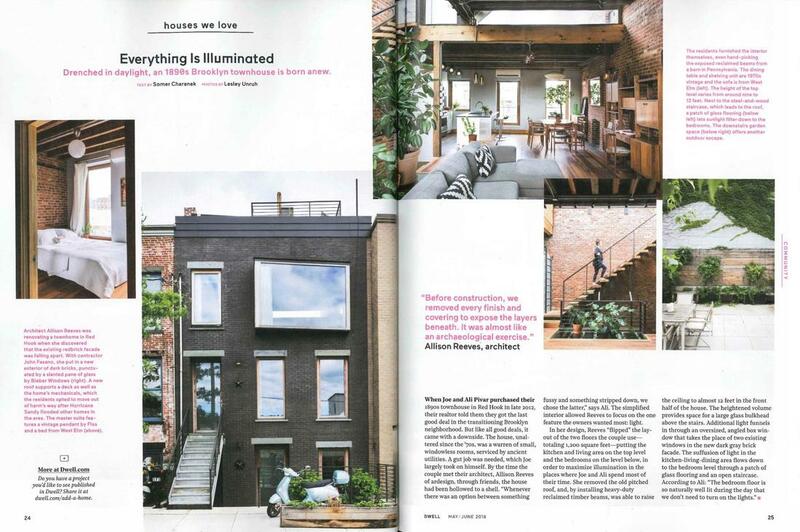 Red Hook House owner and ardesign make the Real Estate section of the New York Times.